Anticipating a future that will be driven not only by traditional academic students but growing demand for technical training and professional trade certifications, Northwestern Michigan College (NMC) is launching a Marine Center in spring 2019 aimed at a new market: current and prospective employees of cutting-edge marine, aerial, and land surveying corporations around the globe. The Marine Center at NMC will offer a combination of existing college courses – such as remotely operated vehicle (ROV) certification, marine data processing, and aerial surveying – with new certification programs and training, most notably in land surveying. In a recent presentation to NMC board members, Hans Van Sumeren – director of NMC’s Great Lakes Water Studies Institute – explained that the program will for the first time bring together “the trifecta” of air, sea, and land technology and training courses to the college campus. “This development is not new in terms of (NMC’s) expertise or abilities, but it’s new in terms of connectiveness across all these programs,” he explained. Land surveying classes will be offered at NMC for the first time as part of the Marine Center, with courses to include Fundamentals of Land Surveying, Route Surveying (Roads, Rails, Bridges), Pipeline Surveying, Forensic Mapping for Law Enforcement, and High-Definition Scanning, among others. Those classes are being offered through a contract partnership with Leica International, allowing NMC to immediately launch the program while saving on personnel, equipment, and software costs. NMC is also launching a new level-one certificate for Unmanned Aircraft Systems (UAS) Applications in the spring, offering hands-on training in numerous fields of drone usage. The Marine Center will offer 31 courses – or sections – to start for the first year in 2019, including 16 marine courses, 5 aerial courses, and 10 land survey courses. Ed Bailey, NMC’s director of technical programs, explains that the college is not just launching new courses – it’s targeting a new market. 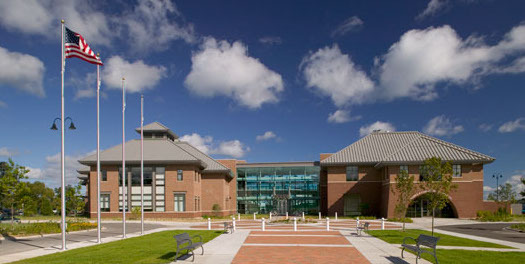 Rather than traditional academic students, who are enrolled for multiple semesters and typically take technology sections as part of an overall degree track, the Marine Center plans to heavily recruit from trade industries to provide continuing education and one-off certifications to professionals. That means many Marine Center participants may focus on just one course or one specialized track – for example, coming to obtain their UAS or ROV certifications, taking required continuing education credits for surveying jobs, or brushing up on new skill areas, such as sensor technologies or imagery analysis. That professional market is one NMC believes offers explosive growth potential. Many of the technology and training programs planned for the Marine Center are not offered anywhere else in the Midwest – or the country. For example, NMC is the sole provider of underwater ROV pilot training credentialed by the Association of Diving Contractors International (ADCI). An estimated two to three dozen students are expected to enroll annually in that 10-week program, which launched in 2017. NMC estimates 300 participants will enroll in Marine Center courses in 2019 – a “very conservative” projection that is expected to grow over the next five years, according to NMC Vice President for Lifelong and Professional Learning Marguerite Cotto. At full “program maturity,” 92 sections will be offered annually at the Marine Center. The college is projecting a net profit from the program of $215,850 in year one, assuming an 80 percent enrollment rate based on early interest and projections. With limited competition in the educational marketplace and specialized equipment and training offered to lucrative, high-tech industries, NMC’s Marine Center courses can command a higher price tag and tap into a market that’s rapidly expanding. That offers NMC a “leading opportunity…in North America” to provide professional development in the remotely operated and autonomous marine, unmanned aerial, and land survey industry sectors, Cotto says. NMC will soon have a clearer sense of whether its optimism in the professional training market will pay off. The college just launched a new website to begin accepting registrations for its 2019 Marine Center classes, with the first courses starting in April. Bailey and Van Sumeren will also attend the national marine technology OCEANS conference in South Carolina later this month, hosting an NMC booth that will roll out the program to over 2,000 industry professionals. The duo expressed confidence to NMC board members that the program will find an audience.